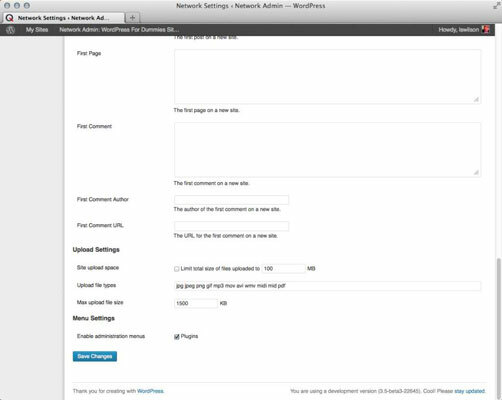 The default network settings on your WordPress site can control user access to various such things as menus, themes, and the Dashboard. Because users cannot add or edit plugins, the Plugins menu is disabled by default. You can still access the Plugins page via the Network Admin Dashboard Plugins menu link, but other administrators cannot. On the Network Admin Dashboard, click the Settings menu link. Scroll down to the Menu Settings section. The check box for the Plugins menu is deselected, which means that users can’t see the menu regardless of their user role. Select the Plugins check box to make the Plugins menu available to site administrators. Save your selection by clicking the Save Changes button. Similarly, you must enable any themes installed on the network before a site administrator can choose the theme from the Appearance menu.